The over 5000 Nigeria Airways workers, who said they had been abandoned, humiliated and frustrated by previous administrations, undertook a solidarity procession in Ikeja to drum support for the re-election bid of Buhari. More than 15 years after the liquidation of Nigeria Airways by former President Olusegun Obasanjos government, the present administration approved N45.3 billion for the settlement of the retirement benefits of the defunct airline workers. This unfortunate situation cannot be allowed to continue under a responsible administration, the minister had said. After the liquidation in 2006, we were intimidated. The then Inspector-General of Police, Tafa Balogun ordered his boys to come and chase us out of the office in the course of which we were tear gassed. Some of us died then while many were wounded since then we had been struggling to get our entitlements paid. They claimed that the management mismanaged money and the company was no longer viable. A panel was set up by President Obasanjo which at the end of the day found out that the allegations were false. A 12-volume report of the panel was submitted to the then President. Obasanjo, however, said there was no going back on his decision to liquidate Nigeria Airways. He continued: the present Governor of Kaduna State, Nasir el Rufai, who was then the chairman of the Bureau of Public Enterprises (BPE) intervened in the matter. The governor said the former President should allow him to run Nigeria Airways for one year without collecting any money from the government but Obasanjo insisted that he had made up his mind to liquidate the company. Within seven days, YarAdua ordered that we should be paid our salary arrears which were implemented then. The late President later set up a panel to look into our gratuity and other benefits but unfortunately he fell sick and in the process he died, he said. Ogunribusan said, though, Goodluck Jonathan, the then Vice President, who succeeded YarAdu was privy to the efforts and plans of his predecessor over their matter, he, nevertheless, abandoned them to suffer. We wrote series of letters to former President Jonathan reminding him of what his predecessor did but he said it was a forgotten issue. As at that time, many of us had died. We were holding series of meetings, consulting prominent Nigerian citizens including Emirs over our issue, but Jonathan never yielded, he said. 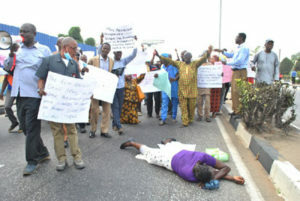 For Comrade Kolawole Ayinla, 68 years old, he said the 14 years of non-payment of his entitlements was hell on earth. I was employed by Nigeria Airways on Oct. 12, 1976, and I worked in the Engineering Dept. The then government of Obasanjo treated us mercilessly. He has no respect for Nigerian citizens, the way we were humiliated was not pleasing. For many years I was admitted in Lagos State University Teaching Hospital and there was no money to pay for drugs and the hospital bills. I have to move with my family to a ghetto in a suburb of Lagos for us to survive. It was worse of experience before President Muhammadu Buhari came to the rescue. The payment of the money had changed my situation. Andrew Ahilemen who broke into tears while narrating his ordeal said he joined Nigeria Airways in 1980 and his employment was abruptly terminated with the companys liquidation. My experience after this had been so bad, I could not take care of myself and feed my family. I could not pay my childrens school fees. We served this country with our sweat and we were thrown out and treated like refugees. We were humiliated out of the office, but I am grateful to President Buhari for what he has done and I am very happy now. I am happy because, with the part of my entitlement that has been paid now, I can take care of myself, feed my family and send my children back to school, he said. More pathetic is the case of Mr Jacob Loremikan who left the service of the Nigeria Airways in 1977 but suffered Parkinsons disease when his pension was stopped after the liquidation. Meanwhile, the Minister of Information and Culture, Alhaji Lai Mohammed has restated the Buhari administrations commitment to the well being and welfare of Nigerians. Mohammed who spoke at the rally by the ex-workers said that Buharis commitment to the well being of the masses led him to end the 14-year wait and suffering of the 5,996 former staff of the defunct national career. It is not just the former staff of Nigeria Airways who have benefitted from the people-oriented policy of this administration. Former Biafran Policemen, former workers of the Delta Steel Company, Aladja, and former NITEL workers have also seen their years of suffering and neglect come to an end, thanks to Buhari. For the more than 800 deceased ex-staff of Nigeria Airways, their next of kin will also receive the entitlements due to them, he said.